James S. Small, "The Analogue Alternative: The Electronic Analogue Computer in Britain and the USA, 1930-1975"
We are in the midst of a digital revolution - until recently, the majority of appliances used in everyday life have been developed with analogue technology. Now, either at home or out and about, we are surrounded by digital technology such as digital "film," audio systems, computers and telephones. From the late 1940s until the 1970s, analogue technology was a genuine alternative to digital, and the two competing technologies ran parallel with each other. During this period, a community of engineers, scientists, academics and businessmen continued to develop and promote the analogue computer. At the height of the Cold War, this community and its technology met with considerable success in meeting the urgent demand for high speed computing for use in the design and simulation of rockets, aircraft and manned space vehicles. The Analogue Alternative tracks the development, commercialisation and ultimate decline of the electronic analogue computer in the USA and Britain. 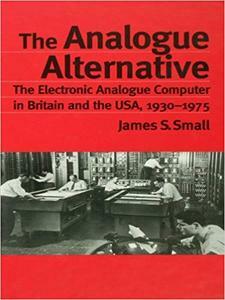 It examines the roles played by technical, economic and cultural factors in the competition between the alternative technologies, but more importantly, James Small demonstrates that non-technical factors, such as the role of "military enterprise" and the working practices of analogue engineers, have been the most crucial in analogue's demise. This book will be of interest to students of the history and sociology of science and technology, particularly computing. It will also be relevant to those interested in technical change and innovation, and the study of scientific cultures.